Have you ever just noticed something was out of place? Our minds tend to put things in order, which causes us to miss mini details around us because the little things don’t just stand out. But just this week, the particulars pushed back when I saw what had to be described as an explosion of yarn around the City of Fairhope. I did not know that yarn came in that many colors as the city appeared to be one very large box of crayons. 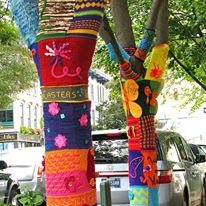 I mean the trees are literally covered with yarn! This curiosity got me to wondering, what is going on? Just seeing the “Yarn Buzz” around town pushed me to find out just where all the excitement originated. 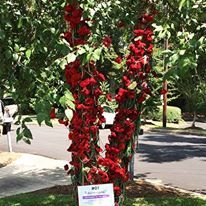 Upon inspection, I discovered that the Eastern Shores Art Center created a new community art project called “Art on a Limb”. 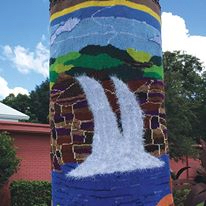 This concept of “Yarn Graffiti” originally started in Houston, Texas by a group named Knitta Please (https://knitta.com) which became a guerrilla kitting moment embraced by artist of types. In 2005, Magda Sayeg knitted a simple door handle cozy and she called this the “Alpha Piece” which started the movement (Moore & Prain, 2009). Magda Sayeg just noticed how plain and cold a city door handle was and just added yarn! Funny that a movement of “Yarn Storming” just started as someone noticed one of the not obvious details in everyday life. I encourage you put on your “yarn colored glasses” and take a stroll around the city before you miss one of most unique displays of art created by artists, everyday people and community businesses.